has anyone tried retin-a micro or tazorac with success? i've tried them ( on my nose) but they always make my nose red and flaky after 1 or 2 nights of use. perhaps i should consider applying it for one hour at a time? on the website of retin-a micro, they advise not to use it on the corner of your nose and mouth as these are sensitive areas. 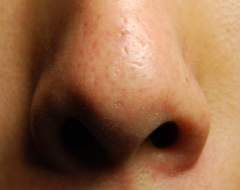 the problem is, the corner of my nose is where a large collection of these whiteheads are located! you can see the clogged pores with white-ish gunk. has anyone had success with retinoids? i just got some retin A micro and it really dries out my skin. how often should I use it? with moisturizer? I have these white things on my chin. HELPP!! I enjoyed the honesty of this post. I have to say I agree too. These white little bumps (especially those on my nose) can be rid of once in a while but it is damn hard on the skin. I've tried A LOT of things. I feel that my skin is always taking forever to heal itself. I'm 20, each relatively healthy, and exercise not very often but I am always walking to class. Is there something that I can take or change nutrition-wise that can help? I am already trying fish oils but that hasn't done much for me. whiteheads on nose - how do you get rid of them? SkinVac Poregripper - have you tried it and does it work? actually i'm not sure if it's either. It's white but it's open on the surface of my skin. It's like the gunk they get rid of on skinvac.com using the poregripper. is there a cheaper alternative to Alpha Hydrox? I've been buying my stuff on drugstore.com for the past few years. "Alpha Hydrox AHA Enhanced Lotion" sells for $10.99. Is this expensive? Is there a cheaper place to get this or is there a cheaper lotion that is just as good? I have a lot of whiteheads that are on my nose. I have tried biore strips but those don't work too well for me. These whiteheads are deep in my skin. Is there some AHA lotion that can be used? how do you get rid of these?